If you’re looking for durable, long-lasting, and beautiful siding for your Chicago area home, there is a simple solution: fiber cement siding, professionally installed by Siding & Windows Group. Fiber cement siding is a solid blend of cement, sand, and cellulose fibers. It’s designed to look like real wood, stone, or even brick, so no one except you will know it’s really fiber cement! First patented in 1901, fiber cement has improved its composition over the years but has remained a strong, hardy option for siding your house. Siding & Windows Group is honored to be a provider of the leading brand of fiber cement siding: James Hardie siding. In addition to providing all the stability and beauty of all fiber cement sidings, James Hardie also provides a Color Plus technology. Our customers can choose from the hundreds of color options and variations, and the siding will come from the manufacturer with the preferred color baked right onto the siding! 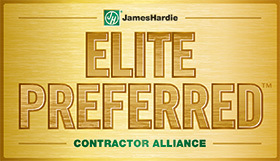 James Hardie hand selects a few remodeling companies to receive the designation of “James Hardie Elite Preferred Contractor”. 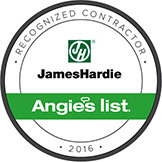 Siding & Windows Group is honored to receive this distinction. It’s fire resistant. Registered as a non-combustible material, fiber cement siding has the best possible flame spread rating. Unlike wood and vinyl siding, fiber cement will not burn or melt in a fire. It will increase the value of your home. In fact, according to a cost vs. value report by Remodeling magazine, installing fiber cement siding can get you a higher return on your investment than any other remodeling project! Fiber cement siding installation came in first place on this report for eight years in a row. It holds up to any kind of weather! From bitterly cold climates to hot and humid locations, fiber cement is not affected by temperature extremes. The combined strength of its materials and its significant thickness also gives it the ability to resist rain and hail. It will not rot or warp. The manufacturers believe so strongly in the durability of this product that they give it a 30-year warranty! It’s low-maintenance. Rinsing it with a hose every couple of years is recommended, but that could be the only upkeep your fiber cement siding needs! If you choose a color finish, that finish will be warrantied for 15 years, after which it may need repainting. It’s resistant to termites and other insects. Since fiber cement is 90% sand and cement, insects have no desire to eat it! We are dedicated to improving the beauty and value of homes all over the Chicago area. If you’d like more information about Siding & Windows Group, or you just have some general siding questions, we would be honored to help you! Contact us to schedule a free, no-obligation assessment at your convenience. Let us help you make your home even more beautiful with fiber cement siding!